This fine old building has been a landmark of Plymouth for years. It is hard to imagine the area with out it. However it now seems that we wont have to imagine it - as it looks like demolition will start very soon. 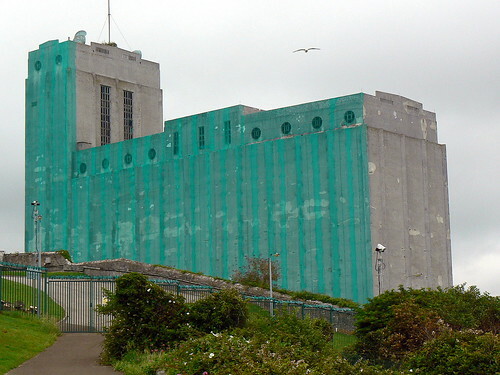 Millbay's disused former grain silo building is scheduled to be demolished. The Herald has learned that demolition work on the landmark next to Plymouth's Brittany Ferries terminal is planned to begin today. It is understood that work could last up to 20 weeks, although this schedule is unconfirmed. Its a shame that no use could be found for this building - but I can understand why it wasn't possible. The UK's largest ports group, Associated British Ports, said an application to demolish the building was submitted to Plymouth City Council in November. The firm could not say last night what its long-term plans are for the site, which is in the heart of the Millbay regeneration zone, but it did say that it is looking to provide a facility for the storage of Brittany Ferries freight.